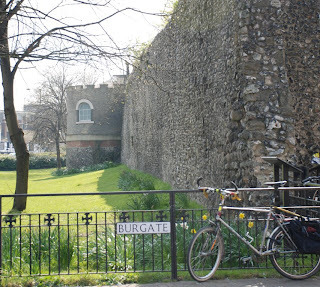 This is Burgate, a road parallel to St George's St. Burgate is quiet and if you follow it, you will find Canterbury Cathedral right next to Starbucks. The wall you see is the city wall that goes around most of Canterbury. Always been mad about bike photos. This is wonderful in such a beautiful setting. Lovely, Rose. It is a nice look at a city wall. I can't imagine living to a part of that history of so long ago. Nice post. I m mad about history and Canterbury offers me plenty of opportunity to learn new things about various periods in History. Have you seen the other post for the past few days? There is so much green around here and even a church where Jane Austen attended. It is said that she based some of her descrptions in areas of Canterbury... so no surprise that you relate these rural scenes with Pride and Prejudice. So did Chaucer's pilgrims congregate at the Starbucks near the cathedral? Louis thanks you for visiting "San Francisco Bay Daily Photo". Mme. la Vache appreciates your kind comment about her photo. The Pilgrims stayed in several different places but the very poor ones were allowed to stay for one night at the Eastbridge Hospital not far from Canterbury Cathedral. Starbucks is relatively new and has been there for no more than 2/3 years. Some people resent them but I don't. We have to integrate the old with the modern and Starbucks generates a lot of jobs so...be it! Your last posts remind me of many things I remember about Great Britain when I was a little girl sent for some weeks in an English family trying to understand one or two words...And I went to Canterbury! Thank you for visiting ArradonDP and taking time to let a comment, always so appreciated. This is beautiful. You live in such a lovely part of England. Such a perfect photograph. What a delightful photo Rose! The soft greens of Spring are just so stunning in the last few of your photos. I love the daffodils hiding behind the bike. And seeing that bike just makes me want to jump on it and peddle around this area. 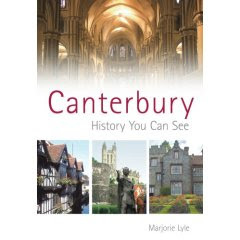 Must visit Canterbury someday! The bicycle really add character to the photo and yes, it is a beautiful spot.